The team at Northwest SUP & Fitness is your go-to resource for choosing the perfect Stand Up Paddle Board to meet your needs and budget! Basically, liters of volume is the measurement of how much weight the paddle board can comfortably carry and still float above the water as the manufacturer designed for optimum performance. For beginners, we recommend a board volume of approximately double your body weight in kilograms. To calculate your body weight in kilograms, divide your total weight in pounds by 2.2 Using myself as an example: my current body weight of 200 lbs converted into kg = approx 91 kg, so if I was at a beginner level I would shop for a board with a liter of volume rating near or above 180. Don’t forget to account for gear if you’re planning on lots of all day iSUP paddle board trips with coolers or like to bring your four-legged friend along for the ride! If you end up with a board that’s rated slightly below your recommended liters of volume, it may feel a bit sluggish and tend to drag rather than plane across the water. If you buy a new traditional SUP or iSUP board with way too low of a liters of volume rating, you’ll find yourself struggling to balance with a paddleboard half submerged in the water! On the flip side, a board with a much higher liters of volume rating then you require will not sit properly in the water and may be difficult to control and heavy feeling. 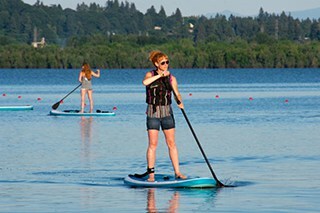 Liters of volume is just the starting point for choosing the perfect SUP or iSUP paddle board for your personal needs. Board width, “displacement” or “planing” hull designs, length, fin placement, board construction, and of course what style of paddling is most important to you whether you’re happy to casually paddle flat water lakes or are ready to cruise long downwinders on The Columbia River are all factors that should be considered before purchasing what should be a long-term investment NW SUP says: Check out the inflatable Stand Up Paddle boards from Red Paddle Co! With their 25psi inflation rating and RSS stabilization system, Red Paddle Co iSUP boards are the most rigid and responsive inflatable paddle boards on the planet! Liters of volume should always be clearly listed on every Stand Up Paddle Board by the manufacturer. If you can’t find the liters of volume rating on a paddle board, don’t buy it! 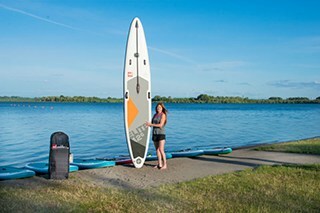 Essentially there are four different primary styles of stand up paddle boards, although many top manufacturer’s are now offering hybrid boards that combine the different SUP board types into unique configurations for paddler’s looking for specific handling and speed characteristics. For the purpose of this explanation we are assuming fresh water paddling is the primary goal and are not including paddle boards designed specifically for surfing or white water conditions, although many of the top manufactures such as Red Paddle Co are now offering iSUP boards that do very well in both freshwater and white water or surfing conditions. Just as the name implies, this style of board is best for flat water conditions and covering more ground than a standard All-Around Board. They have the same basic shape & design as the All-Around Boards, but tend to be a bit longer with a narrower body which allows them to cut thru the water faster. Most Flat Water Paddle Boards have an almost banana-like shape to them, with both the nose and the tail protruding above the water line to help the board glide over the water without plowing. On my first day paddle boarding, even though I was using a rounded nose All-Around Board I was still struggling with balance. The idea of a narrower board was intimidating! Within a month, I was already wishing I had more speed & agility, and soon thereafter purchased my first of many Touring Boards. If I could give any advice on purchasing your first SUP Board, it would be to start on the SUP Board that will most fit your needs and trust yourself to learn the board’s unique characteristics. 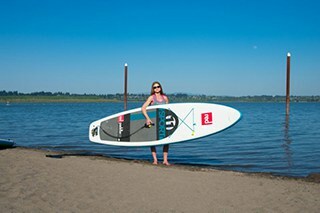 NW SUP Says: Our Go-To Yoga & Paddle-fit SUP board is the 10’8 RIDE MSL from Red Paddle Co. The 34” width and ultra stable design coupled with ease of transport only an inflatable paddle board can provide makes them the perfect choice for paddle folks looking for a high quality all-around iSUP! Buy your 10’8 RIDE MSL now! Touring Paddle Boards utilize a Displacement Hull design with a wider stance and flat front for improved stability at the sacrifice of top speed while still covering ground at a solid pace. Ideal for long paddles! Buy a 13’ 2″ VOYAGER+ MSL or the very popular 12’ 6” VOYAGER MSL now! A Race Paddle Board will have a sharper nose made to cut through the water and a raised profile up front designed to instantly shed water rather than pool & drain, and typically are much narrower and more difficult to balance on for beginner and even many intermediate stand up paddlers. Most Race Boards are longer in length, which along with their typically narrow width gives them an arrow-like look. These are all about speed! Personally, I love my Race iSUP Board and will often choose it over my Touring iSUP Board unless we’re hitting bodies of water that require a lot of maneuvering. These boards are designed to go as fast as possible in a straight line. With a traditional fiberglass Race Board, the longer design also makes transporting and packing down to the launch more of a hassle. They are not nearly as nimble in the turns as the other SUP board types, but with some muscle and finesse can be used in almost any water condition. On this particular type of board, although we have seen several beginner level paddlers jump on the Red Paddle 12’ 6” X 28” ELITE inflatable paddle board and do just fine, we agree with the general consensus and strongly feel this is not the right board for a beginning paddler. Check out my personal Race Board here. The new Red Paddle ELITE Inflatable Race Boards come fitted with a special fixture that is compatible with a Railblaza or Ram Mount, enabling you to securely attach a GPS to keep track of your speed & distances during training and racing! A Hybrid Paddle Board will combine traits from the standard paddle board designs into unique configurations, allowing paddlers to find the exact board for their specific needs. Maybe a Race board is just too “twitchy” on the water for your liking, an All Around Board isn’t fast enough to keep up with the group, but a longer Touring Board is more board than you need?? Perhaps it’s time to check out a Hybrid Paddle Board! 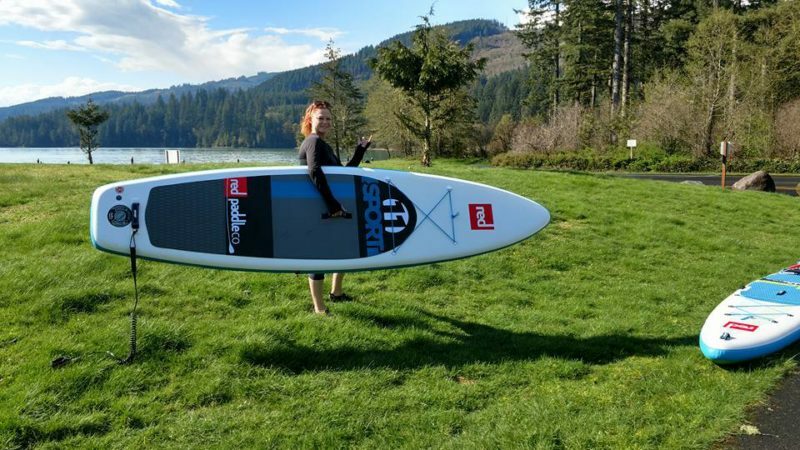 Red Paddle Co produces a very popular Hybrid Paddle Board with their SPORT MSL series of inflatable paddle boards that truly fall into their own category. Combining the speed driven shaping of a Race Board with the stability of a Touring Board, the SPORT MSL inflatable paddle board comes in 3 different sizes to fit all body types & skill levels of paddlers. The SPORT MSL inflatable paddle boards are extremely stable making them a great first board for beginners to “get their feet wet”. They also provide exceptional speed and handling characteristics making them an ideal choice for experienced paddlers. These are the best bang for your buck for a “Do Everything” inflatable paddle board! As your shopping for the perfect SUP or iSUP Board, you’re going to see countless other categories and types of paddle boards in both traditional fiberglass and inflatable SUP boards. Keep in mind, they’re all just adaptations of the basic board designs outlined above. Looking for the ultimate Fishing Board but still want to paddle the local lakes with your SUP buddies? Buy a nice stable Flat Water inflatable paddle board like the Red Paddle 10’ 8” RIDE and easily accessorize with the provided threaded mount and a standard fishing pole holder! Found a company selling Yoga-specific boards for twice the price of a nice All-Around Board? You can easily purchase adhesive traction pads and apply them to any type of stable design paddle board and save some money. Love the speed of a Race Board but don’t want to sacrifice cargo capacity? There are multiple suction cup cargo holding systems available at very affordable prices! My personal Bark Eliminator did not come with any cargo space, but $30 later and I had a suction cup bungee system that has never once come loose or given me issues out on the water. There are also many Hybrid Boards on the market. These boards will combine characteristics from the other primary board types to further define your exact needs. 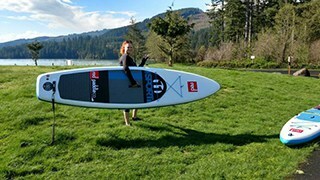 One of Michelle’s favorite paddle boards is her Red Paddle 11’ 3” SPORT MSL, which is essentially a Touring/Race hybrid and provides the stability of a wider Touring Board while allowing her to keep up with me if I happen to be on one of our faster boards. This is an EXCELLENT choice for beginners willing to take some time to learn the sport! 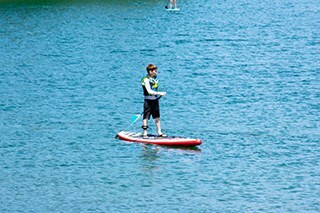 Obviously we’re big fans of the Red Paddle Co inflatable paddle boards! We attend Paddle Events all thru the Pacific Northwest and have personally paddled pretty much every top name brand of SUP board on the market. In our opinion, Red Paddle is putting out some of the most rigid & performance driven iSUP’s available, and at much more affordable pricing than other top brands. 25 psi inflation, MSL Fusion, and their RSS Stiffening Rods truly set them apart from any other inflatable SUP we’ve paddled. We also enjoy the versatility & ease of transport only an iSUP can offer. Being able to load 4 paddle boards in the back of the car is pretty awesome! That being said, we still have several traditional hard surface boards in our personal fleet. We still own our first all-foam paddle boards we bought many years ago when first introduced to SUP (I’m sentimental, I just can’t bring myself to sell them). Our number one priority is to share our love & knowledge of SUP with others. We’re here to help you, no matter what brand or type of stand up paddle board you’re looking for or whatever your questions may be. You have 2 types of boards to consider when purchasing your first Stand Up Paddle Board; Traditional Hard surface or Hardboards, or the increasingly popular Inflatable SUPS or iSUP Boards. Both have their advantages and disadvantages. In a perfect SUP world, it’s great if you can afford to own one or more of each board type. If you’re on a budget like most of us and purchasing multiple paddle boards isn’t a feasible option, we would suggest a quality Inflatable SUP board. Storage & Transport are never an issue with an Inflatable SUP, they can be stacked directly on top of eachother or rolled up into a storage bag. Thanks to top iSUP brands like Red Paddle Co, the price, quality, and performance of iSUP boards are very comparable to hard surface boards. Both Inflatable and Hard Surface boards are available in all the same basic designs. The main difference when considering Inflatable Boards is the vast difference in quality. Many of the cheaper Inflatable SUP boards may resemble a real paddle board but are in essence glorified pool toys. The cheap inflatables are also very susceptible to punctures. Spending a few extra bucks up front for an Inflatable SUP from a high quality manufacturer like Red Paddle Co ensures a durable board that will last for many years and perform at your expectations even as you move from beginner status to experienced paddler! Another huge factor is durability. Quality Inflatable Paddle Boards are much more durable than their fiberglass counterparts, which is why most SUP Rental Companies are now utilizing iSUP boards in their rental fleets. If you’ve ever owned a fiberglass board, you know all too well how susceptible they are to rock chips/damage. If you accidentally drop your inflatable board, it won’t chip or scratch, whereas a drop onto pavement with a fiberglass board can cause some serious damage. Fiberglass boards use an outer shell, which if compromised can allow the board to become water-logged. If top speed is your main objective and budget or transport isn’t a concern, a high end fiberglass race board is going to be faster on the water than a comparable iSUP. 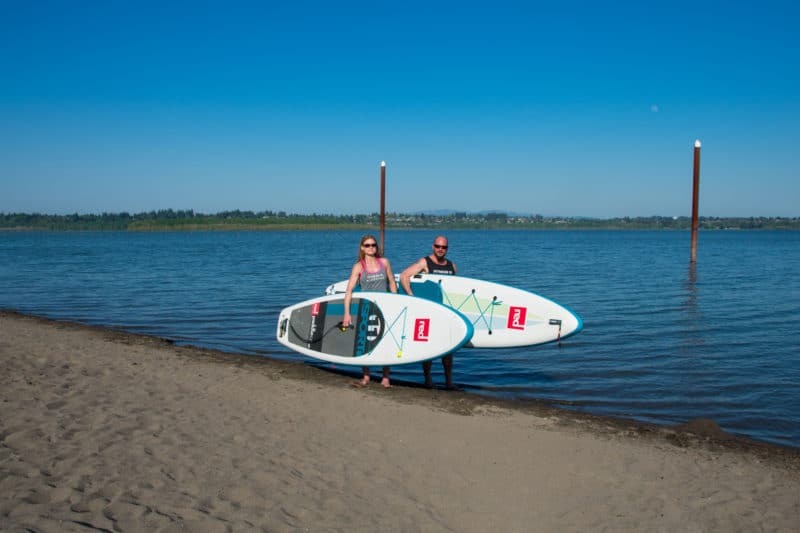 Our Fleet of SUP Boards at NW SUP & Fitness is primarily composed of Red Paddle Co inflatables due to their ease of transport and extremely stable design that’s perfect for beginner paddlers. Hot Tip: A quick way to tell if the Inflatable Board you’re considering is worth the investment is to check the manufacturer listings for suggested PSI. If the maximum suggested PSI is anything less than 14 PSI, it’s a pool toy and should not be considered for a long term investment! iSUP Boards with higher PSI ratings mean they have a stronger stitch & seam design and are less likely to “banana” when inflated. The higher maximum PSI rating of quality inflatable boards is also a good indication of the rigidness of the board. Red Paddle Co inflatables have a maximum air pressure rating of 25psi! The high air pressure capacity of 25psi along with Red Paddle’s patented RSS (Rocker Stiffening System) makes them one of the most stable and rigid inflatables on the market today! We hope you’ve learned a few things from the Team at NW SUP & Fitness. Our goal is to share our love of SUP and vast experience with all styles & types of SUP Boards with anyone looking to paddle, from beginners looking for their first board to advanced paddlers looking for their next board. If you have any questions regarding Stand Up Paddle Boarding, please let us know and we’ll do our best to help you find the perfect SUP Boards and/or gear for your individually based needs and answer any other SUP related questions including information about our favorite SUP destinations.